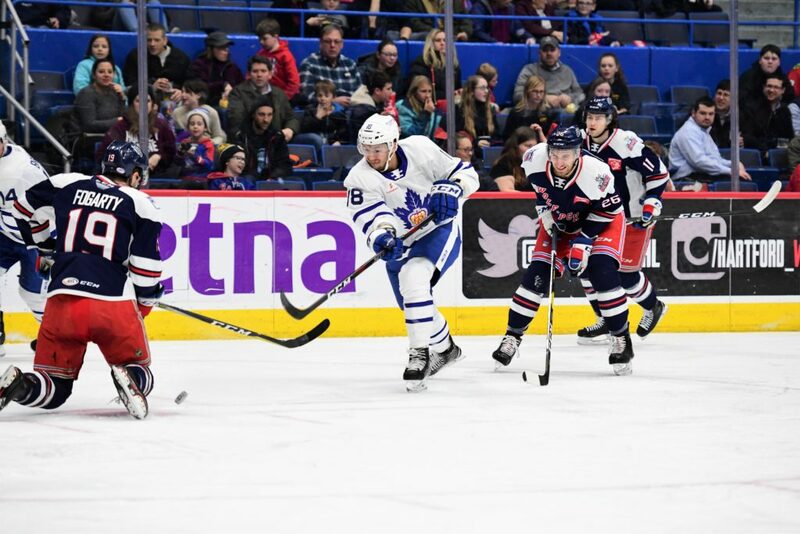 The Toronto Marlies visited the Hartford Wolf Pack Wednesday night for their first of three straight games on the road.After taking an early lead thanks to a power play goal from Calle Rosen, the Marlies were unable to maintain a lead as the Wolf Pack clawed their way back each time. Rosen’s power play goal came at 4:50 of the opening frame as Dmytro Timashov set him up for a one-timer from the high-slot. Sam Gagner picked up the secondary assist on Rosen’s sixth of the season. 16 seconds later, the home team responded as Vinni Lettieri beat Michael Hutchinson to even the score 1-1. 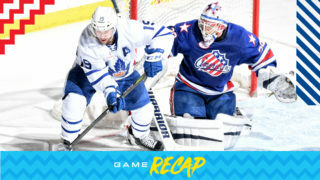 The Marlies held Hartford to only six shots on goal in the opening frame. Although they peppered Brandon Halverson with 18 shots, the score remained tied at the end of the first. Pierre Engvall restored the Marlies lead at 16:37 of the middle frame with a strong individual effort. 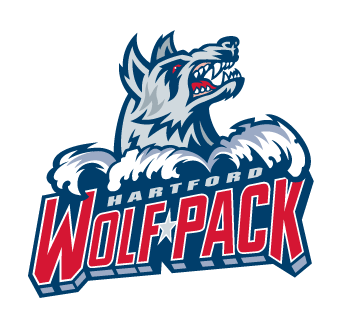 Following a feed from Michael Carcone, Engvall beat Hartford defenceman Sean Day to the outside and drove the net beating Halverson to make it 2-1. Minutes later, a tough turnover on a power play cost the Marlies as the Wolf Pack notched a shorthanded goal to once again even the score. The Marlies outshot the Wolfpack 14-6 in the middle stanza and the score stayed locked at 2-2 heading into the final frame. A late goal from Tim Gettinger was the difference maker and sealed a 3-2 win for Hartford. Up next, the Marlies visit the Providence Bruins for a 7:05 PM puck drop on Friday. Calle Rosen opened the scoring on the power play at 4:50 of the first period. Rosen is tied for second in the AHL for defencemen in points (38). Rosen has 12 points (2 goals, 10 assists) in his last 11 games. Pierre Engvall scored at 16:37 of the second period. Engvall has 21 points (13 goals, 8 assists) through 46 games this season. Dmytro Timashov recorded the primary assist on Rosen’s first period power play goal. Timashov has 13 points (1 goal, 12 assists) on the power play this season. Sam Gagner registered the secondary assist on Rosen’s first period power play goal. 11 of Gagner’s 24 assists have come on the power play. Gagner has recorded assists (2) in consecutive games. Michael Carcone had the primary assist on Engvall’s second period goal. Carcone has 10 points (6 goals, 4 assists) in 17 games with Toronto this season. Rasmus Sandin picked up the secondary assist on Engvall’s second period goal. Sandin has 12 points (5 goals, 7 assists) in 21 games this season. Michael Hutchinson stopped 23 of 26 shots he faced. Hutchinson is now 7-4-3-1 on the season with a .899 Save Percentage and a 3.22 Goals Against Average. Toronto went 2-for-2 on the penalty kill and 1-for-2 on the power play. The Marlies’ power play is first in the AHL on the road (28%) with 30 power play goals. Toronto had a 45-26 edge in shots in all situations. 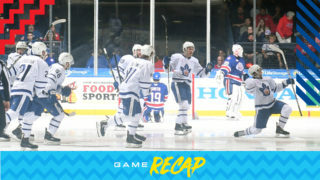 Andreas Borgman, Pierre Engvall and Calle Rosen led the Marlies with four shots on goal. 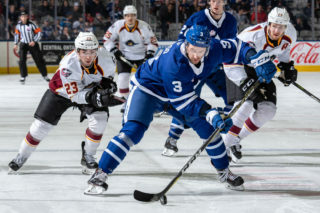 The Marlies are 6-4-0-0 against Atlantic Division opponents and finish the season’s series 1-1-0-0 against the Wolf Pack. Toronto is 21-5-1-1 when scoring first. The Marlies are 7-4-2-0 when tied after the first period and 6-2-2-1 when tied after the second period. Toronto is 13-9-3-1 when outshooting their opponent. The Marlies are 3-3-0-1 in Wednesday games and are 3-1-2-0 in February. This is Toronto’s first regulation loss in February. Sam Gagner has recorded assists (2) in consecutive games. Colin Greening (illness) did not dress for tonight’s game. Timothy Liljegren (ankle) did not dress for tonight’s game. He left Toronto’s game on December 1 against Wilkes-Barre/Scranton. He is week-to-week with a high ankle sprain. Mason Marchment (collarbone) did not dress for tonight’s game. He left Toronto’s game in the first period on February 1 against Laval and did not return. Chris Mueller (hamstring) did not dress for tonight’s game. He left Toronto’s game in the third period on February 10 against Belleville. You look at it and I feel like we had the puck a lot today. I don’t know if we did a good enough job creating quality chances. I thought in the second period was where the bulk of our offence was. We had a number of chances in tight, in really good shooting areas and we failed to convert on those. Ultimately that is what causes us issues, in terms of not being able to generate enough offence to win a game. We gifted them two goals. The first one has no business going in the net and the second one, we give them a 2-on-0. At the end of the day, it’s the difference in the game. I liked the fact that you know, we had Engvall playing out of position today (and) it’s his first game playing centre. I thought he did a really nice job for us there. I thought MacMaster had his best game today with us. Those were some of the positives but when you have the number of people out that we do, you need other guys to step up, make plays and find ways to get on the inside. We didn’t do nearly enough that today and that’s why we don’t get the points. Greening is day-to-day at this point. We’re hopeful that he can be all right by the weekend but he’s day-to-day and we’re going to have to see how he progresses in the next little bit. Mueller (hamstring) is going to miss an extended period of time. We don’t know exactly how long but it’s going to be weeks. After a five-game homestand, the Toronto Marlies (25-16-5-3) are back on the road kicking off a three-game road swing tonight in Hartford. 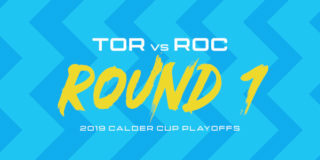 This is the second meeting between these two teams this season, with the Marlies leading the series 1-0 after a 3-2 win on home ice back on October 20th. The Wolf Pack (20-25-3-3) are fresh off a 5-2 loss to Lehigh Valley and have been on a slide with only one win in their past 10 games. 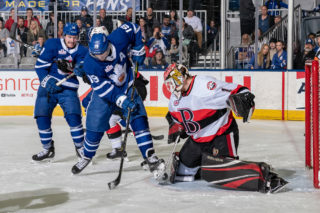 The Marlies have won six of their last 10 but will be looking to bounce back after an overtime loss to the Belleville Senators on Sunday. 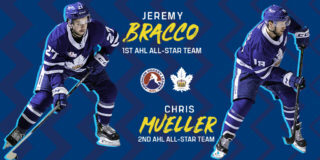 Players to watch: With four points in his last three games and 49 points on the season, Jeremy Bracco sits second in team scoring and leads the league in assists with 35. Calle Rosen leads all AHL defencemen in assists with 32. He’s registered seven assists in his past six games. Peter Holland leads the Wolf Pack with 47 points and has registered a goal in his last two games.